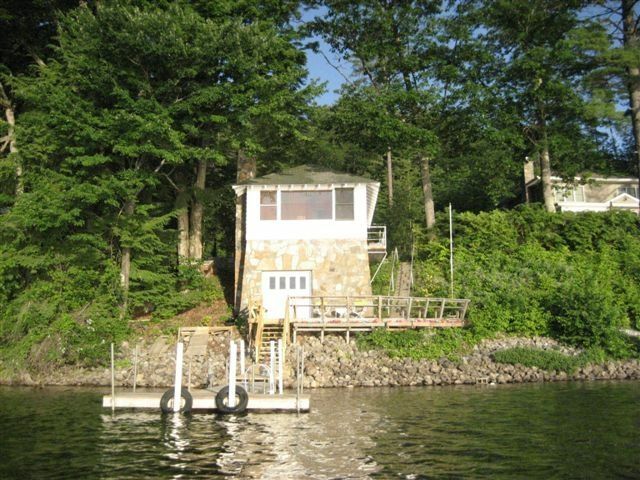 Private, serene, one bedroom boathouse getaway on Beautiful Schroon Lake. Just renovated-includes full kitchen, bath, living area, large windows, fireplace with gas insert, nicely furnished, wireless access, satellite TV, DVD, etc. The mountains and lake views from the boathouse property are fabulous. The owner of the property has the right of way to use this area to get into the lake etc.. This is one of the nicest properties on the lake. Just 45 minutes from Saratoga, 45 minutes to Lake Placid, 20 minutes to Gore Mt. Whether you want to sit back and relax, or get into the Adirondack outdoors, this is the place to be! Weekly, monthly or seasonal rental available. Best setting on Schroon Lake! : When you look out from the living area of this bome,you are in awe your surroundings. The kitchen is new as is the bathroom. The view is great and the location is very peaceful and enjoyable. There are 2 kayaks,1 row boat and a canoe. If you bring a boat, it should be used by the tenants only. The drinking water is provided by a 280 ft. well and is the same as is delivered to the main house. We loved our stay at the boathouse SO much. It was incredibly peaceful and private with STUNNING lake views and our own private dock! Mary Ann could not have been more sweet or accommodating. We'll definitely make the trip back there when we can. The boat house is lovely and clean. The view of the lake was just what we were looking for. Had a great time kayaking on lake. And Mary Ann the owner was very helpful. The dock had gotten damaged from winter and we booked last minute. But she was having it fixed that week. With the dock in it really will be a perfect getaway 5 star. We would return. Perfect cozy, winter get away with warm host! We may not be the typical visitor arriving in weather of single digits and negative numbers, however Mary Ann's Boathouse was a warm welcoming into winter! Within 15 minutes of driving we found multiple trails perfect for snowshoeing, and a great local town perfect for a bowl of chowder and fireplace conversation. We woke to watching the lake freeze just a bit more each day, and rested the evening with a home cooked meal and plenty of scrabble. A perfect retreat getaway, surrounded by nature's best! Mary Ann was a gracious host, opening up her home and property during the holiday week. Mary Ann was a perfect host. We brought our 20ft sailboat and Mary Ann jumped in the water in her jeans to help secure it to the mooring. We felt at home and the accommodations were a perfect size for two. The kitchen was well-stocked and there were lots of nice-sized towels. The boathouse was very clean. The view was beautiful. Mary Ann was very flexible and made us feel welcomed the whole time. The space was clean but had a lingering odor of mildew. The WiFi connection that is stated in description is a lie, you have to stand in front of the owners home to get access, it is not within the boathouse which was extremely frustrating. The bed is a full size and was so uncomfortable I don't think I slept the entire time. We left two days early because of that. The view was lovely and it definitely is quiet. The owner is lovely and gracious. If you're looking for an off the grid kind of experience this is perfect. I was sorry to hear that my renters had problems with the Boathouse rental. There is internet access but you have to make sure that you position yourself in a specific location within the boathouse. I have had no complaints with previous renters regarding internet service and I wasn't aware of the problem. Their is a "queen size" bed (not a full size )in the Boathouse and I have never had complaints regarding it being uncomfortable. They were a very nice couple and I was sorry that everything wasn't to their liking. I was unaware that they had left early because I was out of town . Clean space with wonderful view of lake. Mary Ann was very kind and attentive. We really enjoyed the place and area. Had great meal out one night. Only gap - which from some perspectives might be positive - is that there was not any access to internet unless close to main house. Otherwise, very pleased. We would definitely return. I live in the main house and the Boathouse is closer to the lake and I respect your privacy.I will provide all necessary linens, paper, and normal soaps etc.